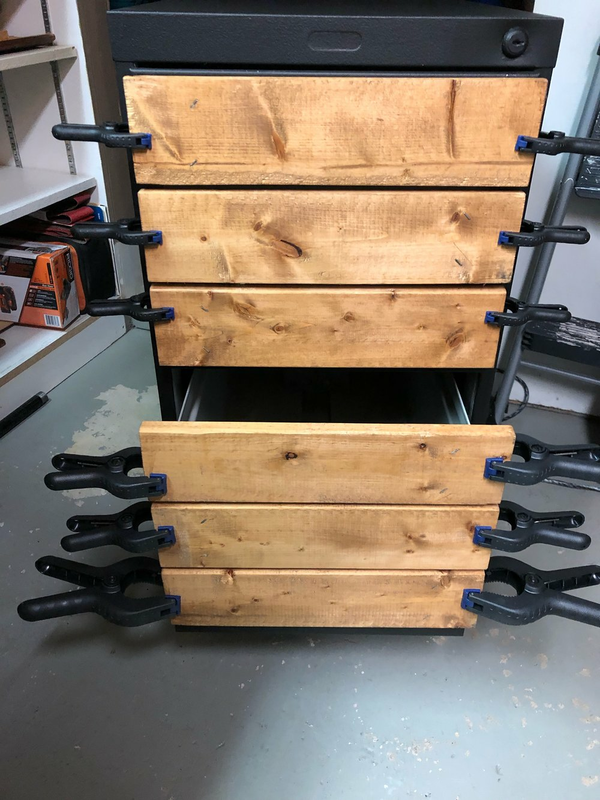 Today I want to share with you this amazing 2 drawer filing cabinet transformation. 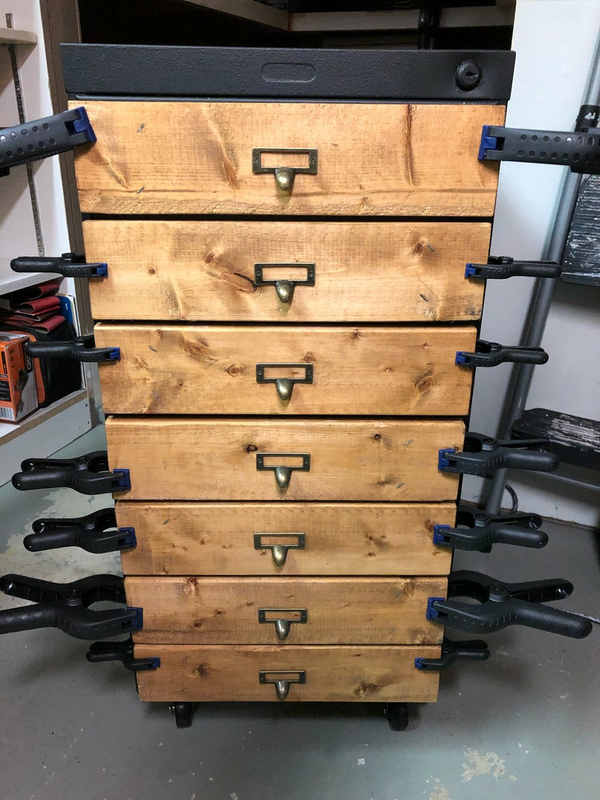 If you’re interested in learning how I turned a Global 2800 series filing cabinet into a vintage Index file cabinet then keep reading. It all started after I finished working on my office space in the spare room; that I realized I needed a short filing cabinet to file away bills and paper work. Often I would end up throwing them into my nightstand drawer and if not there they would end up in a basket that sat in the corner of my now office space/walk in closet. I had a very large pile of papers builging up in the corner of the room that was driving me nuts. Being someone that is tidy and well organized for the most part this was something that I couldn’t stand to see. I quickly took to Facebook marketplace, Letgo and Kijiji in hopes of finding a small filing cabinet that I could use but for a very inexpensive price. I even checked out my local Restore. They did have one but it was smaller then I was hoping for so I ended up leaving it behind. Now it’s funny how the universe works; sometimes it will just put right in front of you exactly what you are looking for or need. Here’s what happened the next day when I went into work, there in front of me was a 2 drawer filing cabinet that had a big sign that read “For Free” …..now how amazing is that. Now the only down fall was the it was locked with no key but lucky for me that I have a super handyman a.k.a Nelson that was able to open it for me. Now about this filing cabinet as you can see from the image below this is what it looked like. I took this image from the Staples website because in my excitement to get working on it I forgot to take of a photo of what it looked like before. Now as you can see it was very plain, not appealing to the eye at all so I had to figure out a way to be creative with it. You know, make it more outside the box decor looking. I wanted something different but what? 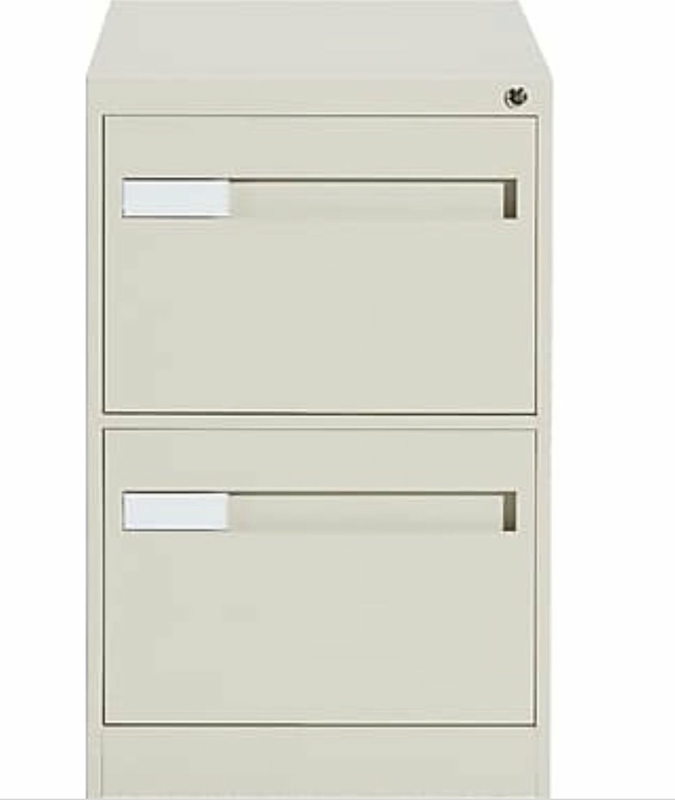 Then I remembered my hunt for a vintage index file cabinet and I thought to myself how great this 2 drawer filing cabinet would look if I was able to convert it into one. This then started my research on how to make this new idea that I had created in my head come to life. Of course Pinterest is always a good place to start. I figured out all the materials that I would need in order to convert this regular filing cabinet into an Index file cabinet. My sources for supplies were: Lowes Canada for casters and clamps. Ikea which I was able to use old bed slats from our old bed frame. Amazon for the pull labels. Some items for this project we already had at home which include the wood stain, stain applicator pad, gloves, glue, paint, sponge roller and tray. For this project you will also needed a drill, drill socket screws, lock washers, screw nuts, a circular saw, sanding sponge or sander, a pencil and measuring tape. Now the first thing we did, yes I say we because I can’t take all the credit for this project. I did get help from Nelson. We went ahead and painted the filing cabinet black. We applied the paint using a sponge roller. We thought that if we used spray paint it might cause the paint to run which we did not want but also with it being mid winter we decided to do this project indoors and didn’t want the strong fumes from the spray paint to linger throughout the house. So for these reasons we just decided that rolling on the paint would be the best thing to do. We did 2 coats on all four sides. We didn’t worry too much about the front being perfect and fully covered as we were going to be covering it with wood anyways. Also we didn’t bother to paint the bottom of the cabinet because we figured you wouldn’t see the bottom either. Then we left the cabinet to fully dry. While the cabinet was drying we moved onto cutting the pieces of wood that were going to be used to reface the cabinet. Now it’s up to you to decide the width of wood that you want to use. You could use pine board which is very thin although we found it to be a little bit on the more expensive side. I think 4 pieces of the 4 ft. board were just a little over $5.00 each which in the end would have cost about $25.00. We felt like it was a bit much for the amount of wood we were getting so we got creative and decide to use the left over pieces we had from the Ikea bed slats. I had used most of the slats for another project but still had some left over. In the end that’s what we went with, even though they were a little thicker then the pine board. We were able to save money which was an added bonus. We cut down the slats just a little so that they sat slightly over the drawer. Over course you could have the wood run from one end of the cabinet to the other if you prefer. When we had all the pieces cut I gave each one a quick sand using a sanding sponge just to remove any little bits of wood sticking out. I then went ahead and started staining the wood using some stain I had left over. I like using the Varathane Early American stain. This is what I have been using on my more recent projects. To apply the wood stain I used a stain applicator pad. This way I don’t use a lot of the stain and it wipes off the excess stain which makes the drying time less. Now back to the cabinet. Once the paint was all dry we turned the filing cabinet upside down and marked out where we wanted the casters to sit and and circled the areas where we would need to drill holes. You will need to use a metal drill bit to make the holes on the base of the cabinet. Please note if you decide to add casters to your file cabinet do not place them too close to the corners as you will not have enough room underneath to add the screw nut onto the screw. Once we had drilled out all the holes we attached the casters using screws and secured them on the inside with the lock washers and screw nuts. We used a drill and drill socket to tighten the screws firmly into place. Now with all four casters in place it was time to move onto the next step which was attaching the pieces of stained wood onto the face of the metal cabinet. I read some people used wood glue and I thought of using it but I prefer to use the LePage Contact Cement glue. It’s super heavy duty . I think it runs for less then $12.00 with tax. 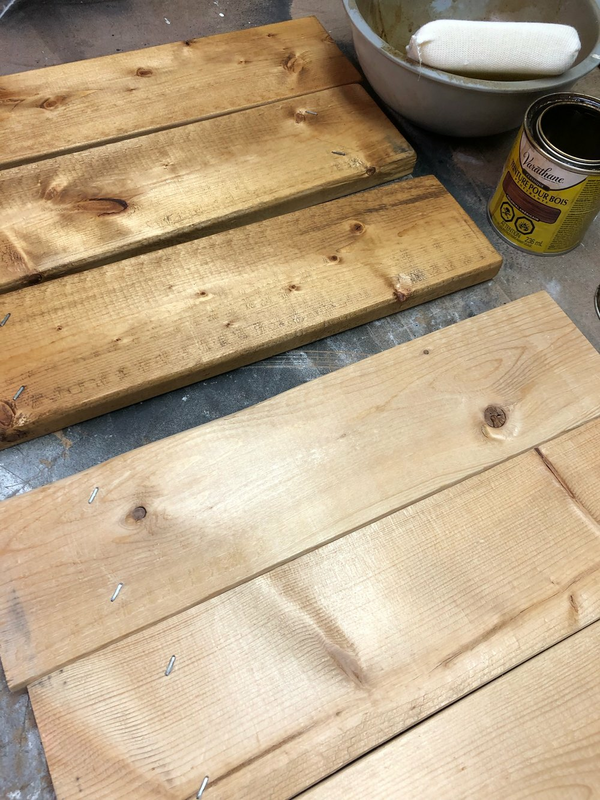 We applied some to the back of the wood pieces and then attached them to the cabinet using clamps to hold them in place while they dried. Now for this step we recommend leaving the clamps on for a few hours. If you start this project in the morning everything should be dry by the evening/night so you can go ahead and remove the clamps. If you start this project later in the day maybe leave the clamps on over night to ensure its fully dry. The last steps which we were able to do while the wood was drying onto the metal was attach the pull labels. The ones we purchased were from Amazon and came with tiny screws already. For this you’ll want to use a small phillips screwdriver. You also want to make sure that you center all the pull labels so that everything looks aligned and neat. Once our project was complete this was what our final product looked like. Now doesn’t this look way better then a regular looking filing cabinet? We totally love our filing cabinet makeover and hope you do too! This filing cabinet makeover cost us about $60.00 in materials which in the end is pretty good considering the cabinet was for free. I hope you all enjoyed this DIY post! If you end up making over your own filing cabinet I would love to hear or read about it! Hi friends, I know it’s been a while since the last blog post but sometimes you need sometime to just sit back and take the time to really think about the content that you want to put out for your audience as well as take the time to plan out your blogs. So that is exactly what I have done. I am excited to bring more new content that you will all enjoy. I really enjoyed putting this blog post together for you. I hope you enjoy it as mush as I enjoyed working on it. Ikea has released some fabulous new items for 2019 and what better way to have a closer look at some of these items, then to sit down and share with you my top 25 must have items from Ikea. Of course I will share with you a mix of their new and old items because mixing new with old is what I do best. I will also add some photos of some of the items that I have purchased from Ikea and show you how I style and use these decor pieces in our home. It’s time to grab a cup of coffee or tea and get your laptop ready to do some cyber browsing with me. Of course if you choose to add any of these items into your cart and click the checkout button, well let’s just say I won’t blame you. Who wouldn’t love the items I am about to share with you. If you’re wondering why these items made the top of my list here’s why. Three things I love are neutral colours, rustic furniture pieces and farmhouse decor. Ikea seems to cater to both those that enjoy a modern look and design but also to those that enjoy the rustic farmhouse style. The pieces I have chosen are not only ones that I love and have purchased for our home but also ones that I think others will enjoy too. And if I am being completely honest with you some of these items are on my wish list. I think now as we head into fall and winter exploring decor items that give a sense of calmness but also add a little warmth to our homes are good items to look out for. It’s important to make your home your sanctuary. Design and decorate it so it feels like home is where you always want to be. At least that’s how I feel about mine. Which can be a really good thing but can also be bad at times because it just makes it that much harder to leave home some days. Here are my top 25 must have items from Ikea. I have provided you all with the item name, description and the cost of each item in CAD. Sharing a photo of our GJÖRA Queen size bed frame from Ikea. We just love the simplicity of this frame and the natural wood look. We have owned this bed frame for about 3 years now. It is made of solid wood and is very durable. If you are looking for a bed frame from Ikea we highly recommend this one. Here is how we use our LOHALS rug from Ikea! It is the perfect jute rug to help bring out the rustic feel throughout our home. We love using this rug in the living and dining room. The LOHALS rug was added under our dining table to make things a little cozier in this space. I was never one to put a rug under our dining table but Nelson seemed to enjoy the look of it and well I think with time it has kind of grown on me. There is just something about this rug. Here’s how I style and decorate using the CITRONSYRA plant pot. The perfect pot for one of my many spider plants that we have throughout our home. This pretty enamel pot has an antique look to it and it goes perfectly with my other antique pieces. A mix of new and old. Love how this display shelf turned out in our kitchen. This piece right here is another favourite of ours. 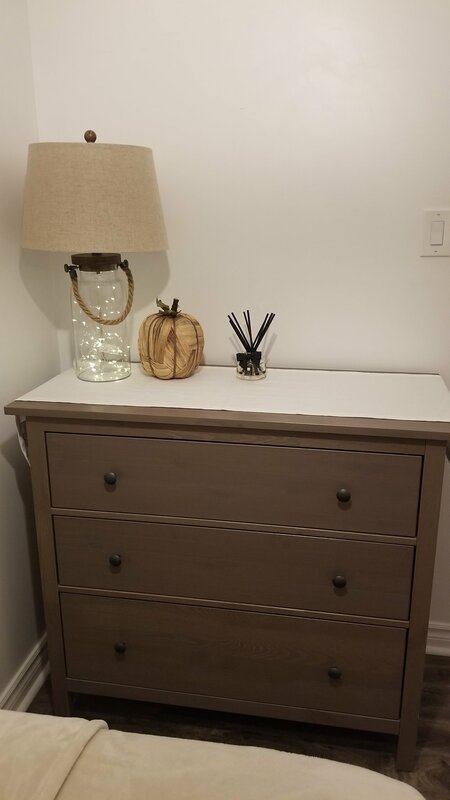 The HEMNES 3-drawer chest. This piece is so versatile because it can be used as a dresser, or a hutch or even and entryway table. This colour especially is one of my favourites. The design and overall look of it has a very country feel to it. This would make a lovely piece to have in your home or cottage. Let’s not forget this beauty. The GLITTRAN kitchen faucet! I was on the hunt for a farmhouse looking faucet and everywhere I looked they seemed to be very expensive. I decided to just have a quick look at the faucets from Ikea and there is was, this lovely kitchen faucet and right within my budget. I took a screenshot of it and off to Ikea we went to pick it up. I wont ever forget this day because it was the day that my friend Lisa and I travelled through the craziest ice storm to get this faucet along with a few other goodies from Ikea. Even though this may have not been the best day for driving around, it ended up being the best day for shopping because all the stores were completely empty that day. Thanks Lisa for being brave enough to drive through some crazy weather, all in the name of decor. Of course I also had to share the SVARTSJÖN hooks. These are just so beautiful and scream farmhouse. They are perfect for you farmhouse lovers. For the price and the quality they are amazing! We needed some hooks behind the bathroom door to hang towels and I thought that these would be the perfect hooks. I am thinking of getting a few more of these and using them behind the bedroom doors. Again these provide a very country and cottage feel which I just love. I hope you guys have enjoyed reading about some of my Ikea finds. 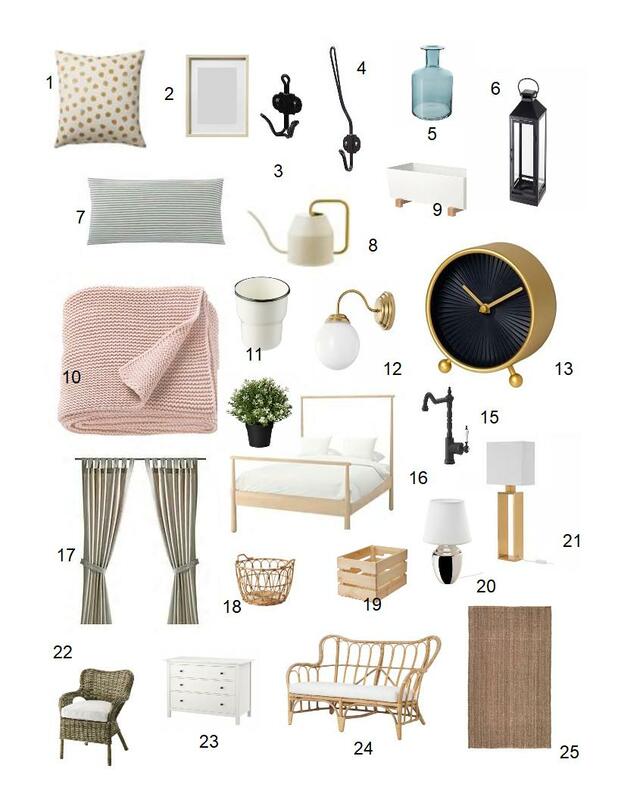 If you purchase any of my top 25 must have items from Ikea please share them in the comments and also do be sure to share your posts on Instagram or Pinterest. I would love to hear from you guys and get your feedback on some of these items. I will also be sure to share any future items that I purchase from this list. I have my eye out on a few of these pieces so stayed tuned to see which items I end up purchasing next from Ikea. How would I love to spend my Friday evenings you ask? Well that's easy to answer, at Value Village of course! I know that does sound silly but it's the truth. It's one of my favourite ways to end a Friday after work. By the way according to Nelson it's also known as “VV Boutique”. He has a way of making it sound really fancy. Now I think I was about 13 years old when I was first introduced to thrift shopping. I remember my mom use to take my younger sister and I to a couple of second hand stores that sold clothes, accessories and many other great things. I remember I use to love visiting them because we would find all kinds of goodies, as I like to call them. Those were the good old days for sure. Somewhere along the way though these favourite stores of ours eventually shut down and were replaced with other stores. The select few of us that had an appreciation for them were sadly left without our favourite stores. It would be years before I ever stepped foot into a thrift store again. It was only until I was about 23 years old and I had moved out on my own, that I ended up back at one. I needed to decorate my new apartment that I had just moved into and money was kind of tight. So instead of shopping at all the pretty stores that cost a fortune for me at the time; I would shop at IKEA and Value Village. I use to love going there on weekends and looking through the home decor stuff because the odd time I would find some really great things. It was like treasure hunting! By the way if you live in Toronto or if you ever visit, I would say that the best VV Boutique location would have to be the one at Bloor and Lansdowne. If you haven't been there yet you are missing out big time! I would recommend visiting on Friday or during the weekend. I swear this place is bumping! It's full of vintage and decor enthusiasts, all looking for the one amazing piece to take home. I remember the first time I walked in on a Friday and thought to myself "Wow all of Toronto must be here." It was packed and yet it was just a regular Friday evening. I love seeing people buying used items and finding new ways to try to reuse them. It makes me feel good to know that we are wasting and spending less while caring for our future. A gold vintage frame I found for $7, totally fell in love with it the minute that I saw it. 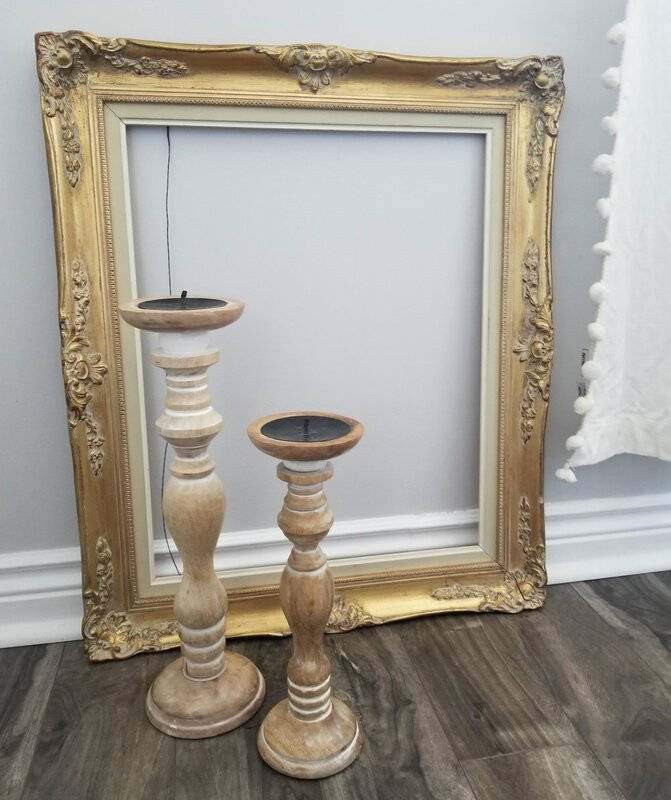 Also these two candle holders for $3 each which such a steal. Love the rustic look of these. I found this vintage piece from Thomas Furnival & Sons. An old Chamber pot used from the 1800s-1900s. Now I use it as a flower vase to hold the pretty flowers from our garden. The aqua blue bottles were a great find too and add a little hint of colour. Well now that I have wandered off track let me brings us back to the present time. Nowadays my love for Value Village is greater then ever before. I really do have such an appreciation for this store. I like to make time at least once or twice a month to shop here. I make sure that I give myself enough time to browse without feeling rushed because in a place like this you need time to LOOK or you just might miss something really good. Before I visit this store I like to make a list of things that I am on the hunt for. It is definitely a good place to go if you like vintage items or just things that have a distressed and used look to them. 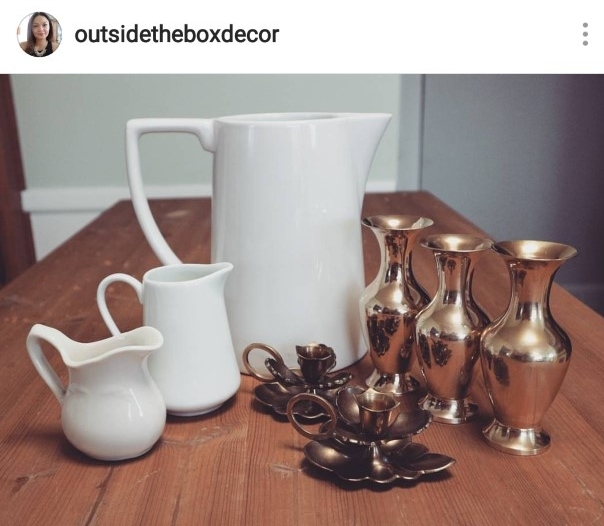 I always seem to get complimented or asked about my Value Village finds; so I have put together some of my top tips for thrift shopping. Take advantage of the Donor Appreciation card. Everytime you donate to Value Village they stamp or punch your donor card. When your card is full you get 30% off your next purchase which is a total bonus. Visit the store on the days that are 50% off which are usually once a month. You save big on those days. Every little bit saved counts for those of us that love to shop. Visit the store regularly. You want to try and drop in at least two times per month. Remember things are constantly being donated so the more regularly you visit the more likely you are to score some really great finds. Search high and low. Most people just look at what is directly in front of them. I search high and stand on my tippy toes if I have to in order to see what is on the very top shelves. I also search low which means bending down or squatting sometimes in order to see what is at the very bottom of the shelves. Move things around. Most times things are sitting on the shelves in layers. Don't be afraid to get your hands dirty. If you don't like the feeling of dirty dusty fingers bring some wipes along with you. Trust me they are good to have in your bag. Have a double look. I honestly don't care if I have to walk around the aisles 2 or 3 times. I go back and scan each shelf again and again because there is a good chance that I might have missed something the first time around. Pause, Search and Review. I sometimes like to pause and search things on Pinterest or Instagram to see what comes up in my search. I try and get some ideas for what I could do or make with the item(s) that I have found. Then I review the items again and see if they will work for me and what I have in mind. If not I leave them and move on. Throw it in the cart. If you are ever unsure or in doubt just throw the item it in your cart because you will kick yourself in the rear end if you leave something behind and someone else snags it up after you. Leave it in the cart until you are sure if want it or not. Last but not least check the odds and ends section. This is where they have items in small little clear bags. I think people under estimate what they can find in this area but trust me it's worth looking. I found some vintage candlestick holders there that I absolutely love! Here are those candlestick holders that I was mentioning to you. Aren't they just so beautiful not to mention the gold vases I found. Plus the small little creamers and this awesome large pitcher. They were all great finds. There you have it some of my tips for shopping at Value Village. I hope that you all find this blog post helpful. I know I sure enjoyed writing it. I would definitely say this store is one of my happy places. I love any store that gets my mind racing and thinking of new and exciting projects. If you follow my Instagram account I often post my findings from Value Village to give all a sense of the kinds of great things that you can find there but also the great things that you can get creative with. I have added some additional photos for you all to see how I get creative at home with my findings. Thought I would also quickly say HELLO to all my new followers. If you are reading this thank you for joining me here and taking the time to read this blog post it means a lot. I appreciate each and everyone of you that follows me on any of my social media platforms. I look forward to seeing you all back here for my next post. These Milk Vases were just too cute and pretty to leave behind. I had to have them! I found all six of these in one visit. Haven't seen a single milk vase in the last couple of visits. I like to think this was a lucky find for sure. Here is how I styled them at home in our dining room. As you can see there are those candle holders that I bought earlier on. Ok so when I came across two of these. I wasn't sure what I would do with them but I knew that I loved the chipped looked of these so I took them home with me. As you can see from the next photo I am so glad that I did. 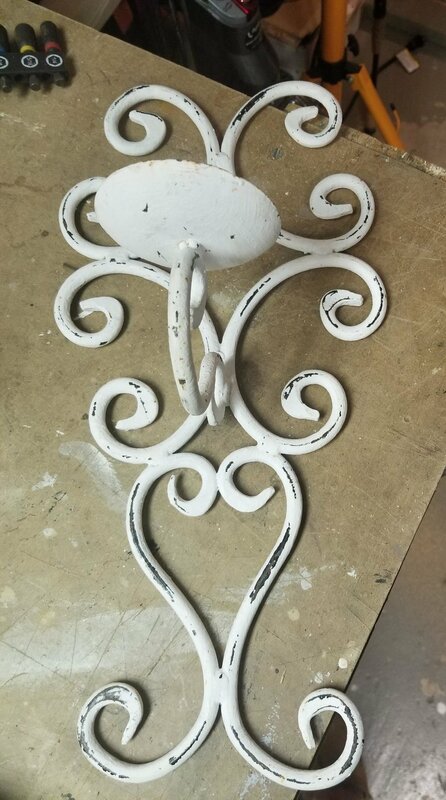 How amazing did these wall sconces turn out. Btw to make these beautiful pieces old fence wood was used that had come down in our backyard during a wind storm that we had a few months earlier. Just another way that I like to show you guys the beautiful things that we can create when we think outside the box. Btw these beauties sold earlier this week. Goodbye chippy wrought iron candle holders. As Nelson would say "On to the next one. " Let's start off by asking what is minimalism? According to some minimalism is a way of simplifying your life. It is a way of clearing out what you do not need and it allows you to focus on what is truly important to you and in your everyday life. It allows you to find balance and restores inner peace by allowing you to feel good about the way you live. Growing up in a small family of 3 (my mom, younger sister and I) we did not have a lot of stuff. It seemed like we only ever had what we really needed. My mom use to say “what I have, I have and what I don’t, I don’t”. I think it was her way of reminding us not to obsess over things we didn’t have but instead to be happy and grateful for what we did. I guess growing up with little allowed me to be creative with what I did have and to to keep finding new ways to reinvent the spaces around me. I grew up with the mentality that less is more which has also transpired into the way that I choose to decorate our home. I like to style and decorate but in a way that doesn’t feel like it’s a lot. There is also another reason that I choose the simpler way of decorating. You see a few years back I was diagnosed with anxiety…yes anxiety. One of the things that really seemed to helped me cope with it was clearing out the spaces around me. That overwhelming feeling that I use to get and that fact that there was always something to clean up use to make me feel anxious. It seemed like the more things I had just for the sake of having, made my anxiety so much worse. Every little thing seemed like a lot and it made me feel overwhelmed very easily. I decided to start clearing out spaces. I started with my closet and got rid of clothes I had been holding onto in hopes that I would some day wear. I kept only pieces that I loved and that I felt good wearing. I did the same with my home decor. Some of the items I no longer cared for but was holding onto them for the fact that they reminded me of my first apartment. My first purchases with my first real job! Sadly I realized this was not enough of a reason to hold onto them. I tackled the kitchen getting rid of old dishes I had that were chipped or just no longer part of a full set. Glassware, cutlery you name it it all went. Slowly, slowly I began clearing out spaces. Our trips to Value Village became more frequent as we got rid of things to donate. Once all those things had gone I had room again. I felt I could breath. My mind was clear. I felt less anxious and more relaxed. From that day forward I promised myself I would only buy things I really loved or that served a purpose; not just for the sake of saying I bought it just to have it. Years later I find this method still works for me. I do a small clear out once or twice a year. I offer things up to family and friends and then whatever is left over gets donated. Most times I decorate using what I already have. I find new ways to use and style the same pieces throughout our home. I usually take to paint to give something a fresh new look. Something so simple as doing this has allowed me to fall back in love with some of my favorite pieces. I also take the time to research things I want to purchase before I make the splurge. Decorating in a more simple way has allowed me to dedicate more attention to certain special pieces in our home. I now enjoy the look of clean surfaces that allow my mind to think freely and be creative. Also because we don’t have a lot of things cleaning our home is so much easier and a lot quicker to get through. There aren’t as many things to dust or put back in their place. Often we are told that our home looks like it is straight out of a magazine (laugh out loud). Again I think that's just because we only have what we really love and need. I know minimalism is not for everyone but it’s what works for us. It is what works for me and allows me to live a more healthy lifestyle. I recommend it to anyone that is looking for a more simple way of living. Reducing all the excess stuff in your home could be a way of restoring calmness and peace back in your life. The dollar store, what more can I say when the name itself screams bargain shopping. Now who doesn't love a good bargain right? It has become one of my favourite places to shop for some really great and inexpensive items. There are so many different dollar stores chains but I stay true and committed to one in particular, Dollarama! Yes it is my absolute and all time favourite. I guess that could also be because as a child this was the one that I remember my mom use to shop at for some household items. In a sense shopping there also brings a sense of nostalgia. Taking me back to the good old days. Now my dollar store trips can sometimes get a little out of hand but that's just because I constantly keep checking back to see what new items come out. Plus it doesn't help that there is a dollar store near our home. I find if you wait too long between trips you could miss out on some really great finds! 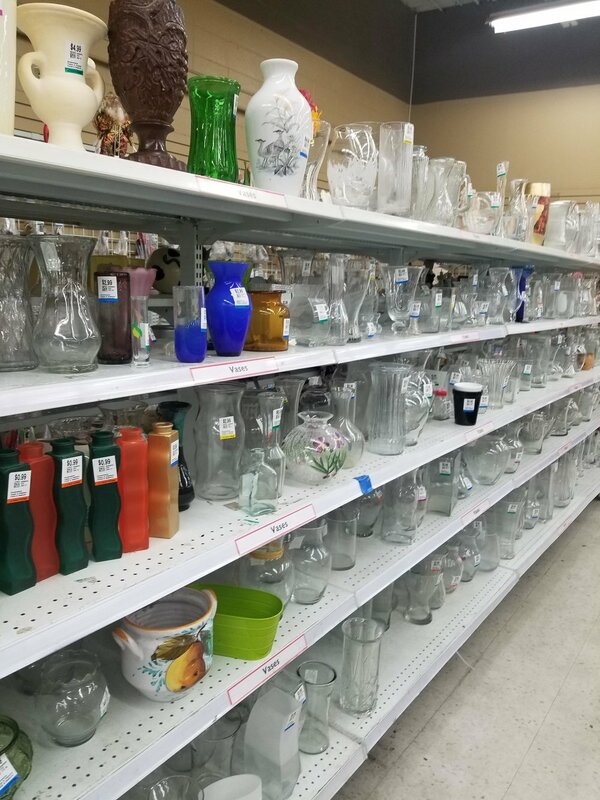 I will share with you some things that I have learnt about shopping at the dollar store as well as what to look for and how to snag a good find. The best time to me to visit the dollar store would be during the week. I find that the one by my house is more likely to put out new items during the week or on a Friday just before the weekend rush. Most times you will see large boxes of items they have coming out to the floor as they try to figure out where and how to display these them. Sometimes the boxes are left wide open so you can actually peak in and see what it is that they are putting out. Don't be shy get in there and have a look. If you so happen to find something you like go ahead and place it in your shopping cart. If they are getting ready to put it out, then it's ready for purchase! Another tip is if you see something on the floor that you like but it seems to be the last one and you want another for the purpose of having 2, or just want one that is of better quality don't hesitate to ask a sales associate. 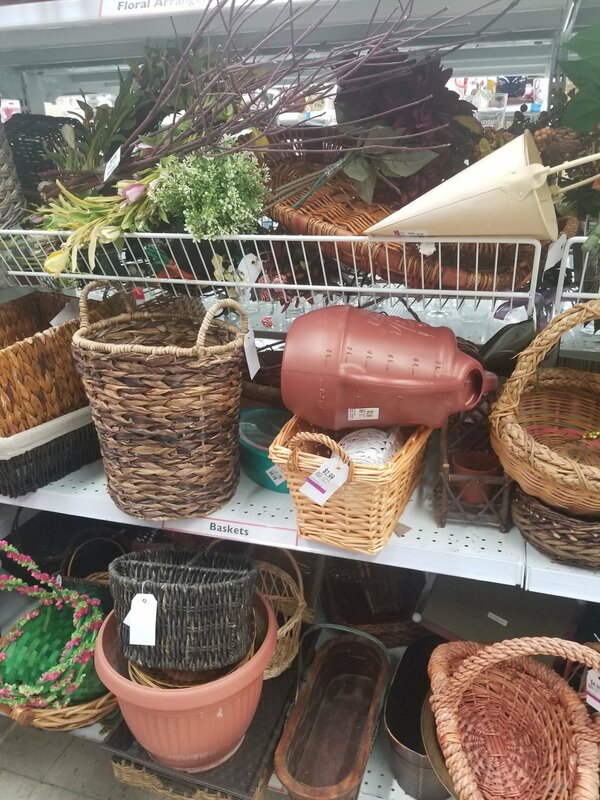 Many times I see something I like but maybe there is a small snag or ding on the item that I'm not too pleased about, I simply ask the associate if they have more in the back. In some cases they actually do and are nice enough to bring out more stock for you to choose from. My next tip of advice is on quality. Now not just because this is a bargain store do I recommend you buying just anything. I mean I love finding a good deal but I pay close attention to the quality of the item. I look for items that I think will last long and are made well. If it looks and feels cheap, I would rather leave the item behind then spend the money on it only to have it fall apart within a few days. Look for any cracks, scratches or loose threads. You want your item to look put together not like it is falling apart. Otherwise it's just not worth spending the money. Wait until something better comes along. Now here is another thought for you. Let's say you see something that you really like and the quality seems to be great but you are not sure what you would use it for or what you could make with it; do what I do and go on Pinterest. I guarantee you that most of the time you will find some inspiration there. For example, last year I found some crystal jars. I really liked them but wasn't quite sure what to do with them so I searched "crystal jars" on Pinterest and found a whole bunch of great ideas for them. I turned mine into candle holders as you can see below. This is something that has become part of what I do on a regular. It doesn't matter if it takes me longer to get out of the store, but I want to make sure that I'm not buying something unnecessarily but rather something that I can actually use or make something out of. It also helps to hashtag the dollar store chain that you usually shop at. For example, on Instagram I usually #dollarama and I tend to find other people on social media that are willing to show off their dollar store finds or dollar store DIY's. Which is another great way to get inspired. Now my next point brings me to something that I have find quite interesting. One day I went to the dollar store just a little outside of my neighbourhood. While there I decided to checked out their artificial flowers. I really wasn't expecting to find anything as I had been to a few other locations earlier that week and had not found any flowers that I really liked. That is until I spotted the Peonies shown below. My jaw drop when I saw the amazing quality, selection of flowers and colours they had to choose from. I quickly snagged a few because I new that these would soon be gone and I might miss my chance at getting them if I didn't. Now the only conclusion I could come to for being able to find such a good selection of flowers that day was the fact that the dollar store was a few store down from Pier 1 and also happened to be across from Homesense. Seeing that there are other home decorating stores nearby that sell similar products it only made sense that they would have the best of the best at this location. The funny thing is that last year around the same time I went to that same Pier 1 and bought a whole bunch of flowers from there and spent a whole lot more, in fact I think they were double the price per stem. This year I think I will check out this dollar store location first before going to Pier 1 or Homesense because clearly there is money to be saved and for the quality who wouldn't. Plus overall I think this dollar store just had the best selection that I have seen yet. Again I think this is due to the nearby stores. I hope you all enjoy this new post. Hopefully it will give you some advice in terms of shopping at the dollar store for future trips. I would also love to hear any advice or tips that you might have for shopping at the dollar store! There isn't a right or wrong when it comes to interior decorating. Although to some it may come more naturally. The key idea is to have vision. If you are trying to figure how to decorate a new space whether it be within your home or your office all you need is to have a little vision. Close your eyes and imagine what your perfect space would look and feel like. What is the feeling that you want this space to bring out in you and in others? Is it calmness? Maybe it's happiness? Or maybe it's a warm and cozy space? Whichever it may be think about that feeling. Then use that feeling to translate it into your vision for your space. If you want your space to project calmness, what colors would best represent this feeling? To some it's white, grey, dusty rose or even lilac, whichever it may be, pick a color that you feel best describes the feeling that you are trying to achieve. The color that you choose will become the foundation for decorating your new space. When it came to our living room I knew that I wanted a bright and airy space. Coming from a basement apartment which did not allow for too much natural light to come in. I wanted to take advantage of the fact that we now had large windows, tall ceilings and a decent sized living space. I basically wanted the total opposite of what we had in our old apartment. Where every bit of furniture was once dark I wanted everything to be light, so that is exactly what we went for. Very early on we found that whites and light greys were our go to colors for decorating our living space and also throughout our home. We were careful to ensure that we added a pop of color every now and then. As you can see from the first photo I quickly took to brown wood tones to break up all the white. It was a good way of balancing things out. The horse painting became our focal point and was actually one of the very first decorative pieces that was purchased for this space. Until this day it is still a main feature when you walk into the living room. The colors found in this painting are also very similar to those used to decorate this space. One recommendation is to find one decorative piece to be your focal point and allow the colors from that piece to help inspire the design of your room. Another helpful tip would be to try to fill your space with decorative pieces you love, not just like, but actually really love. I think a lot of times we are in a rush to get everything decorated all at once, but I have come to learn that it's about finding and picking a piece that you love and maybe even tells a story. Those are the pieces that stand the test of time. In the past when I have bought a something that I just liked, I found that I ended up growing tired of it and sometimes even getting ride of it and donating it. When I take the time to find pieces I love or really want I am more likely to keep it for years to come. Which brings me to next tip of advice. Find pieces that you know will work well with existing ones that you already have at home. This in the end will help you avoid spending unnecessary money and possibly even having regrets down the road. For example if you want to buy a cushion ask yourself "will this cushion go nicely with the color of the couch? Could I use it in a different space if it doesn't work well in the living room? Take the time to ask yourself these questions because they will save you a lot of time and money in the end. Btw if you are curious about our flooring...well lets just say that it's the one thing in this living room that I didn't pick out. I give full credit to my hubby on that one. We went with a grey laminate flooring mainly because of Oso (our Olde English Bulldog). We wanted a floor that was going to be easy to clean and could withstand and scratch marks from his paws. This flooring made for a great option. Originally I wanted a lighter grey flooring but once the laminate was down I absolutely loved the darker grey! This was another good way of balancing things out between light and dark and it was also in keeping with our grey color scheme. One cool thing about this laminate flooring is that it has these awesome grooves in it. Giving it that aged barn wood effect. When picking flooring think about your life style and what would work best for you. Also take your pets into consideration. I am so thankful that we can't see any marks on the floors from his paws. You might see the odd little scuff or chip of flooring here and there but that's all me from constantly moving furniture around. I know, I have issues. Well almost 2 years later all I can say is that we haven't changed much in this space except for the layout of the furniture and the odd decorative pieces which do change from season to season or from holiday to holiday. For the most part though the colour scheme and main furniture pieces have remained the same. Which I can say I am very happy about! If you like this blog post give it a like down below or share it with a friend! I hope you'll join me for my next one.